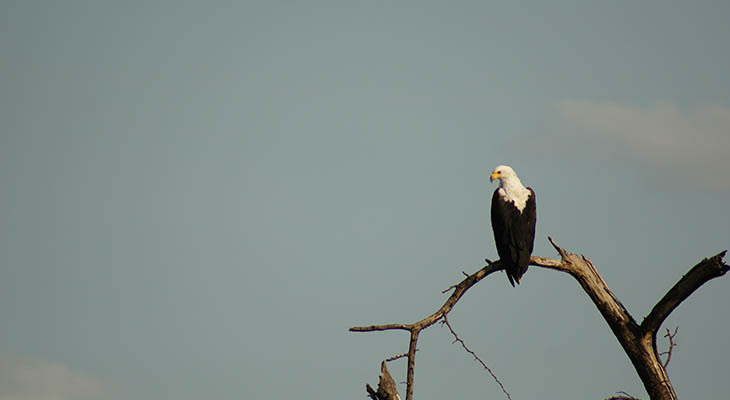 An incredible ten day tour through multiple game reserves and forests with our expert birding guides. 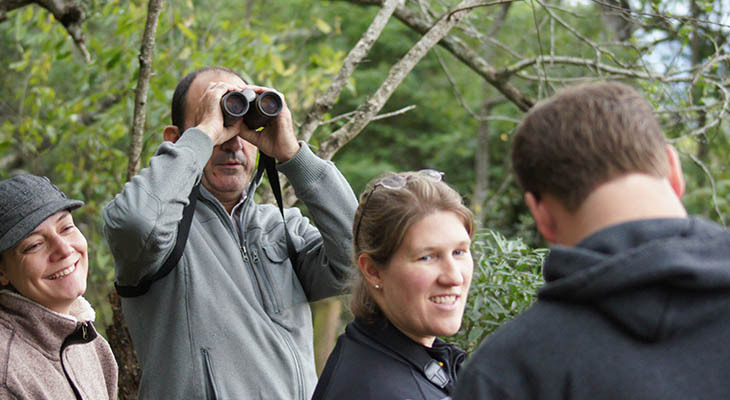 Learn why Kwa-Zulu Natal is world-famous for bird viewing. Forest, grassland, wetland, bushveld, mountains, estuarine, coastline, and open ocean habitats make this Southern Africa's most diverse area for birding. With 63 Southern African endemic or near-endemic species present, this region is a must on any birders' wish list. See below for a day-by-day outline! Depart Durban for Richards Bay. Our first stop will be Amatikulu Nature Reserve. This reserve is small (2100 ha) and situated about 100km north of Durban. It is one of the few places in southern Africa where wildlife can be viewed feeding on forested dunes overlooking the sea. It occupies a narrow strip along the coast, reaching a maximum width of 3km and a length of 20km. 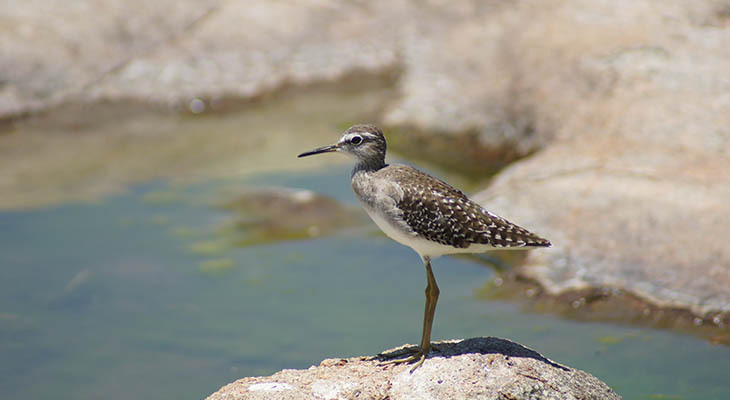 Despite its size, the reserve contains many different habitats (including coastal, riparian and dune forest, grassland, lala palm bushveld, an estuary and a freshwater pan) the variety of which has resulted in a checklist of over 300 birds. The reserve lies at the confluence of the Amatikulu and Nyoni rivers, the latter running uniquely parallel to the Indian Ocean for about 8km. Specials include Black Coucal, Green Twinspot and Swamp Nightjar. After our visit to Amatikulu we depart for the Dlinza forest aerial boardwalk in Eshowe. Eshowe, A place of diversity, is situated close to the capitals of the old Zulu kingdoms. In times gone by it was the colonial capital of Zululand, and it is steeped in Zulu and colonial history. Eshowe is situated around a 250 hectare indigenous coastal scarp forest, and offers a variety of attractions, the most striking being the majestic Dlinza forest itself, with hiking trails and picnic spots and the magnificent new Dlinza forest aerial boardwalk. The boardwalk, the first of its kind in Southern Africa and exclusive to Eshowe, is a 150 meter walkway built above the forest floor, which allows visitors to view flora, fauna and avifauna at a comfortable level. 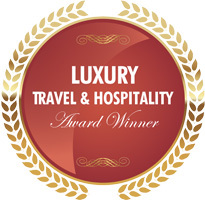 It ends with a 20 meter steel tower, offering dramatic views of both the forest canopy and surrounding countryside. 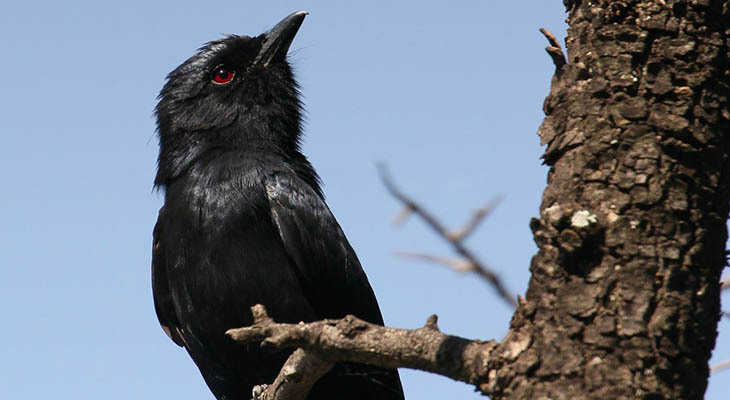 Specials include the Spotted Ground Thrush, Narina Trogon, Eastern Bronze-naped Pigeon, Grey Cuckooshrike, African Crowned Eagle and Olive Bush-Shrike. After enjoying a light lunch we depart for Richards Bay. Dinner & overnight Richards Bay. After Breakfast we depart for Ongoye Forest. This beautiful remnant patch of coastal forest is interspersed with patches of rolling grasslands between granite outcrops, and lies along a ridge of hills that overlooks the Indian Ocean. 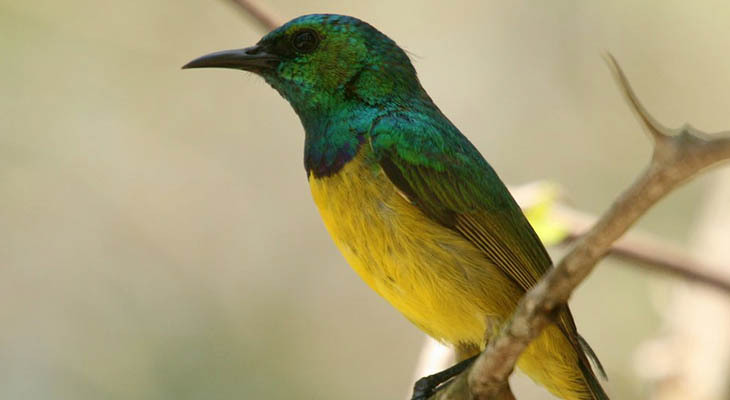 Ongoye forest is also the only place to see the Green Barbet in Southern Africa - other specials of this forest include the Green Twinspot, Green Malkoha, Olive Woodpecker, Olive Bush-Shrike, African Emerald Cuckoo, Yellow streaked Greenbul and much more. We return via Mtunzini where we will be on the lookout for the Palmnut Vulture. Late afternoon visit to Thulasihleka Pan. Overnight in Richards Bay. Our final night in the HluhluwDepart Richards Bay for Mkhuze Game Reserve. En route we stop and explore Muzi Pans. Muzi swamps or pans are locally renowned for the abundance of waterbird species that occur here. The swamp is a typical coastal plain wetland with patches of sedge-marsh, open water, bare shores and some floating vegetation. Muzi pans are an excellent area to spot the elusive Pel’s Fishing-Owl, Lesser Jacana, African Openbill, Dwarf Bittern, Collared Pratincole and more. Dinner & overnight Mkhuze Game Reserve.e/iMfolozi Reserve will be spent at Impila Camp, which will afford you the opportunity to relax after the wilderness trail. Today will be set aside discovering this premier birding destination. Mkhuze Game Reserve boasts one of South Africa’s highest checklists for a protected area with over 400 species recorded here. The reserve supports a wide diversity of eco-systems, which in turn supports a wide diversity of Fauna and Flora. The main habitats in this protected area include pans, swamps, Acacia thornveld, Sand Forest, Riverine Forest and open Woodland. The day will be spent visiting the numerous well situated hides within this reserve. Specials include Broad-Billed Roller, Stierling’s Wren-Warbler, Pink throated Twinspot, African Broadbill, African Barred Owlet, Retz’s Helmet-shrike, Crested Guinea fowl, Bearded Scrub-Robin, Green-capped Eremomela, Green Malkoha, Southern-banded Snake Eagle, Black Bellied Starling, African Hawk Eagle and much more. Overnight Mkhuze Game Reserve. After breakfast we depart for Tembe Elephant Park. Tembe is situated in the north-eastern region of KwaZulu Natal, adjoining the Mozambique border, and is 300 square kilometers in extent - making it the third largest game reserve in KwaZulu Natal. Apart from the “Big Five”, Tembe also supports a wide diversity of Fauna and Flora, including the rare and elusive Suni antelope. 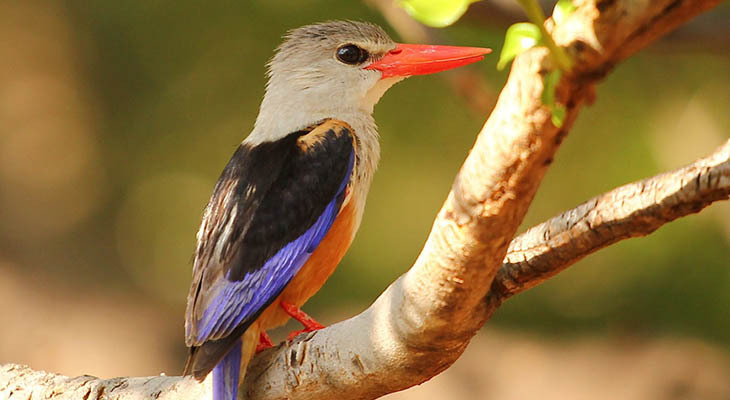 Tembe is a bird-watchers paradise, with more than 340 species recorded in the park – including the rare Rudd’s Apalis, Neergaard’s Sunbird, Pink-throated Twinspot, Rufous-bellied Heron, Natal Nightjar, Woodward’s Batis and Palmnut Vulture. We overnight at Tembe Masizwane Lodge. Ndumo Game Reserve is situated on the banks of the Phongola and Usutu river and lies adjacent to Mozambique on the northern coastal plain. Despite its relatively small size (about 9000 ha), Ndumo Game Reserve is one of the most attractive game reserves in southern Africa. Ndumo is arguably one of South Africa’s most productive birding areas, with well over 400 species being recorded here and several of them being at the southernmost limit of their range. The straight boundaries of this reserve were arbitrarily drawn by cartographers in 1924, these erstwhile gentlemen being instructed by the then minister of lands, Deneys Reitz, to set aside land for a game sanctuary in the area. This was done initially to provide refuge for Hippo, and Ndumo is, at present, one of the few places in South Africa that can boast large numbers of these animals. Reitz had the foresight to realize that unless an area was set aside, little would be left for future generations of the rich animal kingdom that once characterized Maputaland. About a third of the reserve is covered by the Mahemane bush which was described by the great hunter and explorer, Frederick Courteney Selous as the thickest bush he had ever encountered in Africa. We spend the day hunting for this reserves specials such as African Broadbill, Slaty Egret, Eastern Saw-Wing and African Skimmer to name but a few. Return late afternoon and overnight Tembe Masizwane lodge. After breakfast we depart for Ithala Game Reserve. Ithala overlooks the Phongolo river valley in the rugged, mountainous thornveld of northern KwaZulu Natal, and offers a wildlife experience second to none. Ithala’s most characteristic feature is perhaps its astonishing geological diversity. Some of the oldest rock formations in the world are found here, dating back 3000 million years. The topography varies from 400 meters above sea level in the north to 1450 meters above sea level in the south near Lowsburg. This gives rise to great diversity of habitats, fauna and flora. We set out and explore this fascinating reserve while keeping a lookout for Mountain Wagtail, Barrow’s Korhaan, Secretary Bird, Black-winged Lapwing, Scaly-throated Honeyguide, Striped Pipit, Mocking Cliff-Chat, African Hawk-Eagle and more. Dinner and overnight Ntshondwe camp. Full day Ithala Game Reserve. Overnight Ntshondwe camp. Early morning departure for Wakkerstroom. The Wakkerstroom area is famous among birders as the easiest area to find three highly endemic species restricted to South Africa’s high altitude grasslands - Rudd's Lark, Botha's Lark and Yellowbreasted Pipit. A total of 13 bird species are endemic or nearly so to South Africa’s Grassland Biome and nine of these, including Rudd's Lark, Botha's Lark and Yellowbreasted Pipit, plus Bald Ibis, Blue Korhaan, Eastern Longbilled Lark, Sentinel Rockthrush, Buffstreaked Chat and Spotted Prinia can easily be found here during a full day’s birding in summer. A second day could yield forest endemics such as Bush Blackcap and Chorister Robin. Add to these another 33 Southern African endemics or near-endemics and it is easy to see why the area is a magnet for foreign as well as South African birders. Habitats range from open grassland to mist belt forest, gorges and cliffs, with extensive wetland habitat in the form of vleis, pans and dams. Overnight Wakkerstroom. Full day birding Wakkerstroom and surrounds. Overnight Wakkerstroom. After breakfast we depart for Johannesburg.